» home » magazine » 2012 » april 2012 » rebuild or retrofit that aging hydraulic press? Today’s metalformers face shorter lead times, tighter tolerances and stricter quality guidelines, all while minimizing their internal production costs. Operating within these guidelines can be challenging when using hydraulic presses purchased as recently as 10 to 15 years ago, which likely employ outdated technology. That’s why many metalformers are considering press rebuilds or retrofits as a to upgrade older presses with new advancements in press technology. There are numerous reasons to consider a press rebuild or retrofit. Slower cycle times and inconsistent part runs can be byproducts of older presses. At the heart of older press technology will likely be a control panel with limited functionality compared to today’s programmable-logic controllers (PLCs). Older operator interfaces have monochromatic keypad displays, and provide a slow update time for viewing critical data. These controllers do not offer a to automate press runs, requiring operators to manually enter instructions with each job setup. Manual setup increases cycle time and the likelihood of errors. Presses more than 10 yr. old may include a manual proximity switch to signal positioning on reversal, a critical process for producing accurate parts. This manual switch is only as accurate as your hand is steady, and parts may eventually fall out of tolerance. In addition, many older presses were designed with small proportional directional valves that provide a slow pressing speed into the part, in order to achieve an accurate reversal position. With today’s servo-quality proportional directional valves, metalformers can achieve positional accuracy and very high flows, due to the rapid response time of the valves. Aging pumps, motors and even hydraulic fluids are not as efficient by today’s standards. In addition, due to enhancements and new options, older power units may not be as economical as new equipment. And, as shops grow and add larger presses, the amount of power needed increases. Last but not least, metalformers must address safety and update their older presses as needed. Upgrading to ANSI B11.2-1995 (R2010) and adding light curtains allows a press to be run by an auxiliary piece of equipment such as a feeder or foot switch, to reduce cycle time. 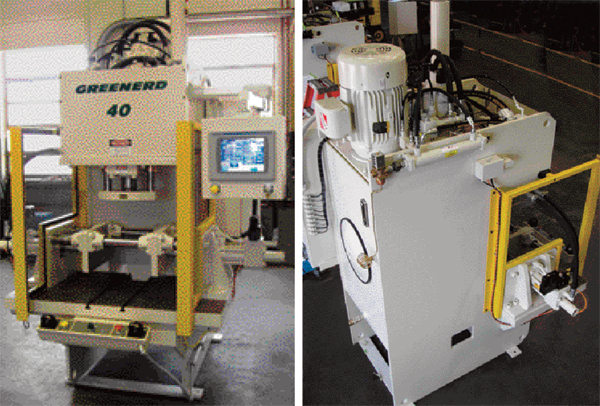 Today’s hydraulic presses are faster and more reliable than ever. In the last decade, the technology has experienced constant upgrade. PLCs and other electronically based controls have improved speed and flexibility. 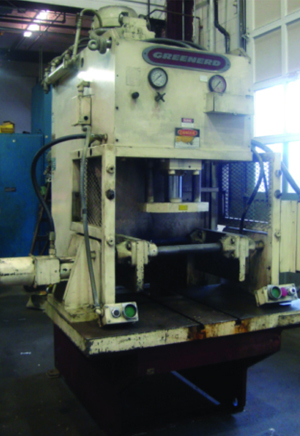 Hydraulic presses purchased as recently as 10 to 15 years ago likely employ outdated technology that restricts cycle times and can cause inconsistent part runs. They also may include a manual proximity switch to signal positioning on reversal, only as accurate as your hand is steady. To reduce cycle times and improve part quality, a press rebuild includes installing servo-quality proportional valves and high-performance PLCs to offer faster response times and improved positional accuracies. Other rebuild services include replacing or rebuilding pumps and motors, rewiring electrical systems, rebuilding cylinders and replacing worn platen guides/slides. To reduce cycle times and improve part quality, better valves and high-performance PLCs provide faster speeds and excellent positional accuracies. Servo-quality proportional valves offer fast response times, even in larger-size valves that can handle the required flow and faster cycle times. Proportional valves offer an improved level of control over older servo valves, without the sensitivity to contamination that can lead to maintenance issues. And, today’s PLCs have scan times fast enough to achieve ±0.001-in. positional accuracy with a D08-size valve, and provide monitoring of the linear transducer to achieve the reversal/positional accuracy of the press. The controller’s high-speed ramping functions provide the ability to manage the increased pressing speed. Using today’s valves and PLCs, cycle times can be improved with simpler and easier-to-troubleshoot circuits. Variable-displacement piston pumps allow flow and pressure to be controlled directly at the pump, simplifying the hydraulic circuit and optimizing horsepower to improve the circuit’s efficiency. As efficiency increases, wear on the oil and hydraulic components is reduced, which in turn reduces the maintenance burden. Using touchscreen press controls, all press-setup points—including those for top stop, slowdown and reversal—can easily be changed. This eliminates the need for time-consuming manual adjustments. This “closed-loop” system is als adjusting itself against stored parameters. A control’s artificial intelligence can even reject incorrect settings, preventing costly accidents. In addition, ram position is tracked by a linear transducer, which rarely needs calibrating. The control can be integrated with a precision digital control system, which enables actual position accuracies of ±0.001 in., and reversal at ±one percent of specified tonnage. Repeatability has improved dramatically thanks to the use of new PLCs and valves. Metalformers can store multiple programs or recipes in the controllers, which can be accessed as needed—a big advantage compared to manually entering program parameters each time a new job runs. This automatic process may eliminate the need for a setup operator, requiring only the press operator to call up the program already loaded with values that have been checked by performing qualifying runoffs. Depending on PLC memory capacity, hundreds of recipes can be stored, enabling the press operator to change programs in just seconds and ensuring that parts are produced precisely and repeatedly every time they are run. Also, modern PLCs are flexible enough to allow the use of multiple programming languages to best suit the current requirement. Quality control is further improved with the use of barcode readers, a growing trend during the last 5 yr. Metalformers use barcode readers to scan the tool and the work order to automatically upload the new parameters for that component. Scans also can be used to validate the press and die against the work order, to ensure that the proper press is being used for the job. An employee’s badge also can be scanned to check for permission to operate the press. New PLCs enable process automation by controlling multiple presses within a line, or by integrating a press with auxiliary equipment. This automation provides consistent control over all press operations. Typical applications include adding roll feeders for advancing sheetmetal in a press, or integrating rotary-index tables into a pressline. Motors are much more efficient today than they were 10 yr. ago. They offer a reduced rotational mass and higher-quality copper for improved winding technology. Pumps are more efficient as well, as improved seals and stronger hoses and couplings have virtually eliminated leaks and greatly minimized maintenance. Even hydraulic fluids exhibit increased effectiveness due to new additives, promoting improved pump performance. Also, state-of-the-art pumps and motors operate more quietly than do their aging counterparts, and they use off-the-shelf replacement parts, whereas replacing components of older pumps and motors can take 12 weeks or more. Another recent development is the use of soft motor starters or variable-frequency drives (VFDs). These devices allow the motor to ramp up to full speed, decreasing the inrush current. A hydraulic press with a VFD will start the motor when the press is ready to perform work, and then shut the motor off when platen movement is not required, including during press idle times. This technology can run the motor at slower speeds when the press is idle, to allow for accumulators to be charged and the oil to be cooled or filtered. Finally, new options for increased press safety might include adding light-curtain circuits, presence-sensing devices, gates and barriers. Solid-state relays for anti-tiedowns on press buttons is another consideration. Metalformers ready for some type of hydraulic-press upgrade should carefully evaluate their goals in relationship to their costs. Here are checklists to help determine whether a retrofit or entire rebuild will prove most beneficial. • Upgrade to the current ANSI B11.2-1995 (R2010) standards for safety. • Build in speed control for handling hard-to-form materials and to increase cycle rates. • Add closed-loop pressure and distance control. • Improve accuracy and repeatability. • Integrate automation components (robotics, feeders, etc). • Add the ease-of-use and accuracy of touchscreen controls with recipe storage. Rebuild services replace existing hydraulic, mechanical and electrical components. If some of the following are needed, it may be time for a rebuild. • Replace old, complex piping/valve systems with a single, consolidated and easy-to-troubleshoot manifold system. • Replace or rebuild pumps and motors. • Replace leaky hydraulic pipe-thread technology with oil ring seals (ORS and SAE). • Replace worn-out platen guides/ slides. • Strip down and repaint surfaces. • Replace ram gland rings and seals. For a look at the benefits that come from a complete press rebuild, consider an automotive customer operating a 1997-vintage gap-frame press. The company recently required an upgrade to make the press ANSI-compliant, while providing all of the quality, flexibility and maintenance advantages of today’s technology. Greenerd replaced all of the hydraulics and electrical components to a modern PLC, ANSI-compliant configuration. The only elements remaining intact were the frame and steel components, which will last indefinitely. Lovely new presses. Love the new guarding too.